This project by Dutch company Essense is a finalist for the Service Design Award 2017 in the category of Professional, Commercial work. 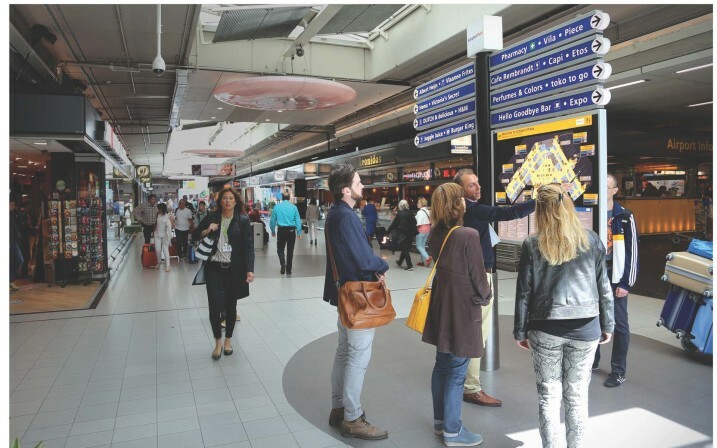 Essense worked with Schiphol Group Marketing team between July 2016 and January 2017 to develop a customer experience vision for all commercial touch-points of the entire passenger journey across digital and physical channels (omni-channel). An existing basic ‘passenger journey’ analysis (with emotion curve) was used as starting point for this project. This only covered the customer’s current emotional experience and therefore triggered the need for identifying new service scenarios as it lacked actionable insights for identifying new commercial opportunities. To achieve this, Schiphol Group hired Essense for defining a clear vision for commercial service scenarios based on customer insights in the context of the entire customer journey. 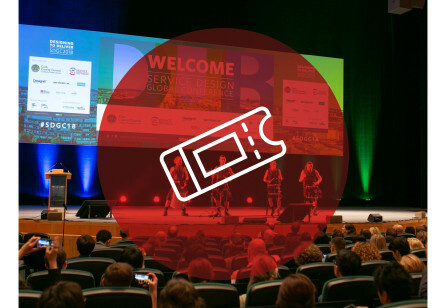 We proposed to frame the full journey context, identifying commercial opportunities and defining relevant commercial scenarios, enhanced with a visual and tangible vision on the desired customer experience across all touch-points. Complementing the passenger journey curve, Essense mapped Schiphol’s three core service areas to the phases of the passenger journey: 1. Parking, 2. Plaza (retail and services prior to security) and 3. See Buy Fly (retail and services after security), which were all three developing their own propositions and customer interactions separately at the time. Mapping these core areas over the different phases of the passenger journey provided a holistic view / journey perspective and thereby also created shared ownership of the customer experience between the 3 marketing stakeholders. Then the ‘AS-IS’ customer journey was completed by adding actionable findings; consisting of pain-points, needs and improvements retrieved from desk research related to the touchpoints the traveller currently interacted with. All insights were then clustered into recurring themes: Time: How much time do I have left?, Findability: Where can I find what?, Expectation: What can or should I do? and Ease: What can help me to feel unburdened? By visualizing this all onto one poster, making it tangible and scannable, it helped us provide the client with a better understanding of their “commercial playing field”: touch-points and possible ‘service’ solutions related to journey phases (‘core areas’), that could be used to relieve current customer pain points. 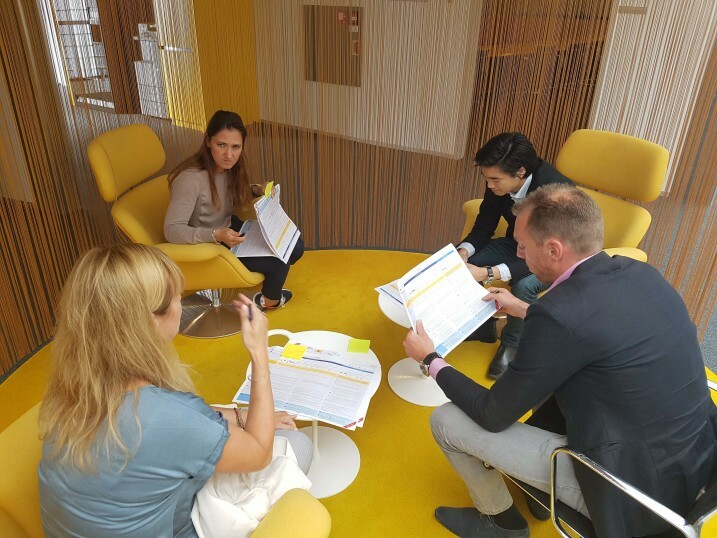 While defining the ‘AS-IS customer journey’, existing insights and learnings were validated and enriched through a two-day ‘service safari’ at Schiphol Airport with the respective client ‘area experts’. This approach helped both Essense and the client to develop a holistic understanding of passenger’s experience and the ecosystem at the airport, bringing our findings from the AS-IS journey to life. This also included additional learnings about the context and commercial playing field (such as parking competitors near the lounge, external security personnel, etc.) that we would have missed without the Safari. To ensure focus and reduce complexity / noise, we limited the scope to Dutch leisure travellers and their relevant touch-points regarding products and services. This service safari also clearly showed Essense that there was little synergy between the three core airport areas. For example: When hopping on the shuttle bus from long-term parking to the airport, a parking video was shown (on repeat) of the parking lot you just came from. There was no promotion / mention of what to expect at the airport where people were heading to (e.g. promotions for Plaza nor See Buy Fly). Desk research had indicated that Dutch leisure travellers were stressed in this part of the journey and therefore receptive to helpful information (e.g. Can I still buy pain killers? Is this before or after security? How long is the que at the check-in gate so I know I can still get there in time or not?, etc.. ). This shows that there was no journey experience yet, but 3 silo experiences. Enhancing the ‘AS-IS journey’ with in-context findings and observations enabled Essense to formulate a number of commercial moments of truth in relation to the customer needs. 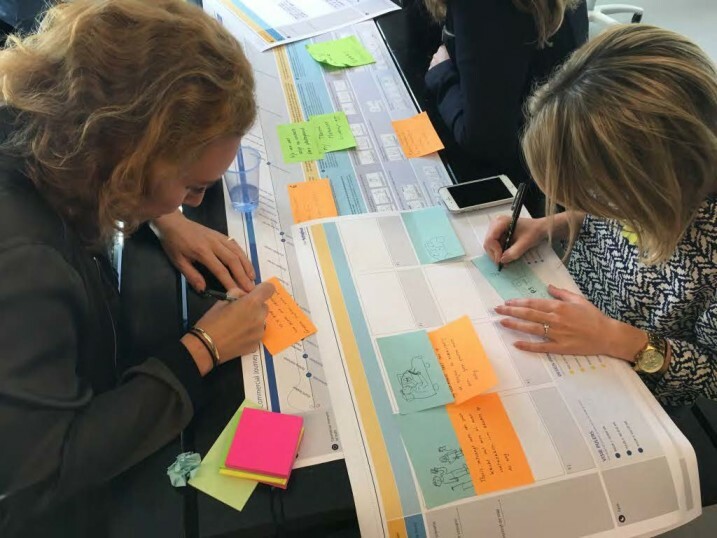 Essense involved a total of 20 passengers in 5 co-creation sessions to validate these needs and moments of truth, to then build on these and work out relevant commercial scenarios with them. These sessions were done in two parts. During the first part participants were asked to draw their customer journey and to highlight pleasure and pain points. The second part consisted of a method called conceptual design proposals, where participants were exposed to a total of 18 statements (concept scenarios) that incorporated both ‘AS-IS’ findings as well as concept mock-ups (in some cases paper prototyped) that were assumed to match their customer needs. Participants were asked to respond to these statements both based on experience as well as on the customer journey they just created. 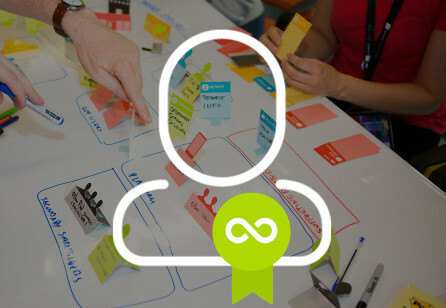 Not just for validation but also for inspiring cocreation building on the (latent) need. 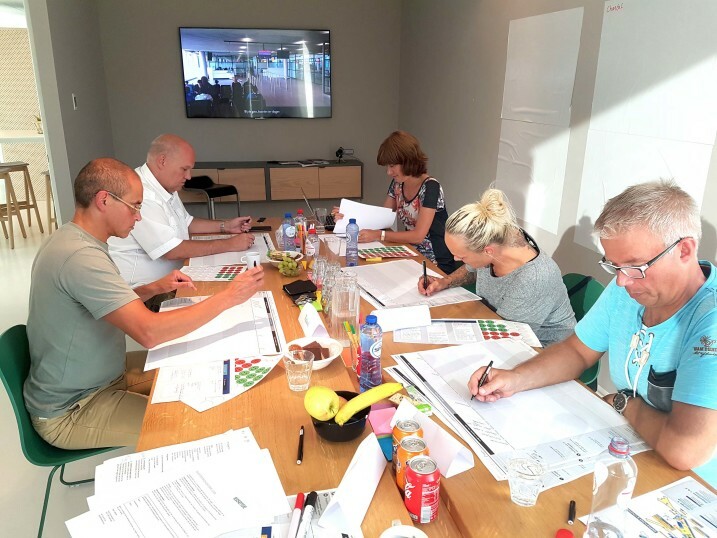 Our client stakeholders were also asked to (passively) participate in these sessions, which they described as a ‘positive confrontation’ of which services and values Schiphol Airport was associated with by passengers. For example, none of the participants knew it was possible to buy products when departing and pick-up when arriving, or passengers claimed Schiphol retail was expensive while our client assumed they were cheaper than other retails shops. 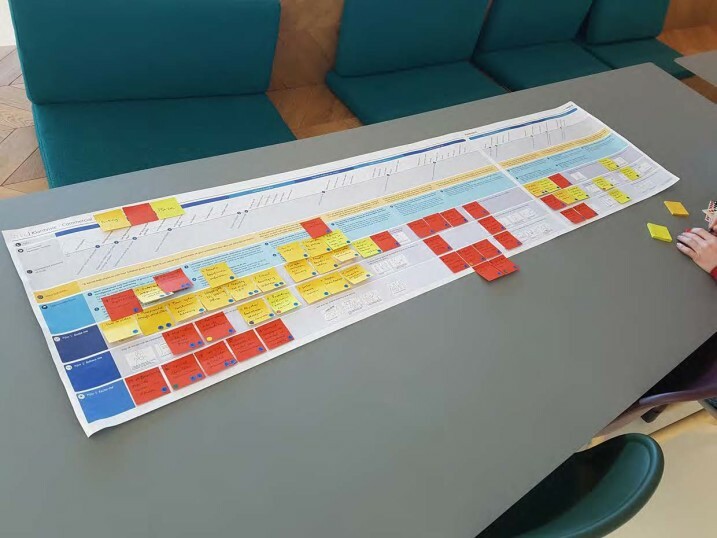 After validating and fine-tuning the customer insights and co-creating relevant service scenarios, we formulated the customer needs explicitly per phase (yellow row) and defined 14 commercial focus points (lightblue row) that we mapped on these phases and customer needs. These were then reviewed and discussed in a client-workshop with all involved stakeholders / domain experts. Essense facilitated this workshop and this really showed that the stakeholders were now taking ownership over the insights and scenarios as they had attended the co-creation sessions. They discussed the importance of certain commercial focus areas with examples they had heard directly of their customers, which was a great way for internalising customer insight. This was also the moment where the client stakeholders started thinking less in ‘silos’ (their core areas), but more in how the different areas could support each other in the journey mindset. For example: Insights had shown that passengers are concerned about having or getting groceries at home when coming back from holidays. Yet they also wanted to go home as soon as possible or did not want to have a hassle with their luggage, so they were not inclined to stop at ‘Plaza’ to get their groceries. To address this, the client suggested to offer getting groceries while waiting for your luggage to arrive (e.g. a ‘breakfast’ box vending machine). Or an idea that groceries were even collected for you and placed in your car once picked up from one of Schiphol’s parking lots or even valet parking. 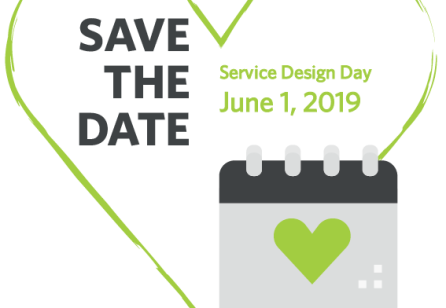 Service scenarios as described above were all gathered and clustered to three commercial pillars, that together with the commercial focus areas, customer needs and commercial touch-points formed the customer experience vision. 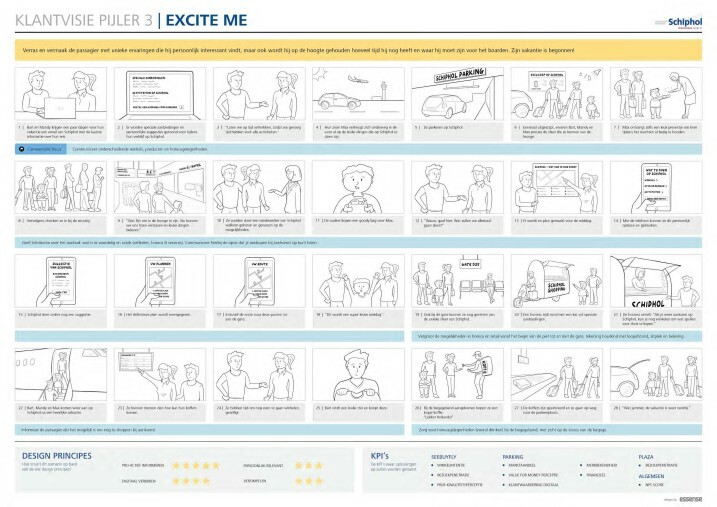 These customer experience pillars were defined as: Guide Me, Relieve Me and Excite Me. 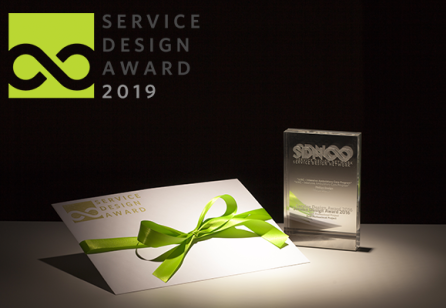 These pillars were deliberately formulated in a snappy manner in order to make them accessible and easily memorable within the entire Schiphol organisation, not only for the stakeholders Essense was working with directly. Per pillar, Essense developed a holistic commercial scenario boards (see above) across channels, phases and services. These scenarios were scored on commercial KPI’s (e.g. NPS, shop intention) and rated on design principles (e.g. omni-channel, inform proactively, enhance digitally). Once the experience strategy was in place, Essense facilitated the roadmap definition by bringing commercial and customer experience objectives together. This was done by defining and mapping marketing activities to pillars. The pillars are now used to bring focus to the marketing roadmap.